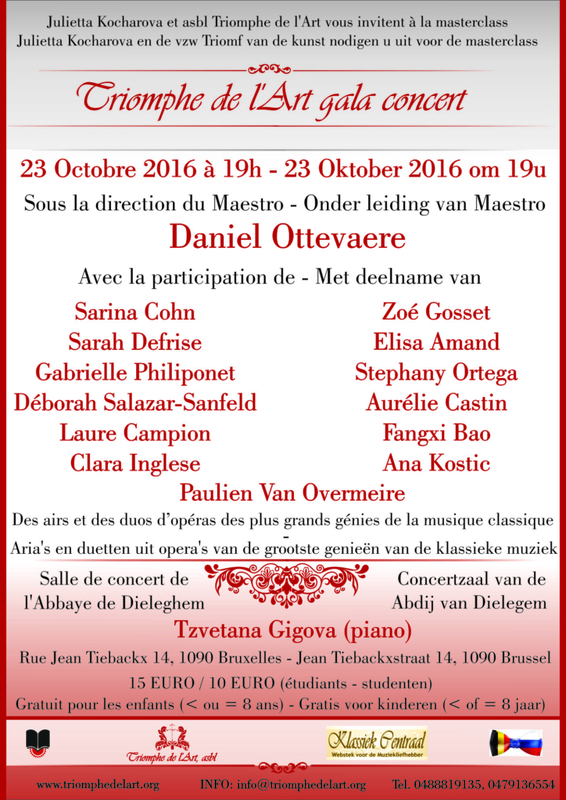 Gala concert of master course of Maestro Daniel Ottevaere : 13 sopranos in one concert !!! We are pleased to invite you to the gala concert of the International Masterclass “Triomphe de l’Art” under the direction of Maestro Daniel Ottevaere. Daniel Ottevaere, bass singer of Belgian origin, studied in Belgium, Austria and Italy before moving to France to study in the School of the Paris Opera. He has since started his career at Paris Opera invited on a number of French and international scenes. Alongside his singing activities, Daniel Ottevaere directed several staged performances and productions. He is also a singing teacher at l’Ecole Normale de Musique de Paris, and the Queen Elisabeth Music Chapel in Brussels. The piano accompaniment is performed by the winner of international competitions Tzvetana Gigova. They will present a virtuoso program composed of masterpieces of classical and popular music. A small banquet will take place after the concert where you can meet and discuss with singers and Maestro. Do not miss! Attention! Presale is available till 20th of October 2016!!! Limited number of seats. Hurry up to book tickets!